One of the best times of the year is berry season (strawberry, blackberry, raspberry blueberry….). Nothing beats the taste of a fresh picked berry. It seems to go by so fast, so I try to consume as many as possible before the season comes to an end. This year I’ve been combining my love of berries with my new breakfast obsession: Muesli! This recipe comes from the Oh She Glows recipe book, and I have made very few changes. I love it because it’s quick and easy to prepare and requires minimal ingredients, which can be switched up depending on what you have on hand. You can also make it the night before as a grab and go breakfast or snack. Rolled oats are called for, but you can also use quick oats. However, you will lose some of the texture using quick oats, and they have a slightly higher glycemic index, so rolled is preferred. Mix all ingredients (except for the berries) together and put in the fridge overnight (or for at least 2 hours). Top with berries, and any other desired toppings, and serve. Ok, so I love nuts. Who doesn’t…? I guess maybe those with a life-threatening allergy… If that’s you, not to worry. Although this time I’m discussing nuts, seeds have a very similar nutritional make up. Nuts are close to the perfect food. They are tasty, good for you, require no preparation, and can be used in almost any dish, sweet or savoury. My family and I eat nuts everyday. Nuts are a very important part of a healthy diet and, unless you have an allergy, should be consumed often. I find most people do not eat enough nuts if they are even eating them at all. Nuts are particularly important for kids. They need foods high in healthy fats to keep them going and to help with brain development, and nuts are a great source of healthy fats. They also contain protein, fibre, and vitamins and minerals. Although the exact nutritional profile differs between varieties, nuts are generally about 10-20% protein and 50-75% fats (mainly mono and polyunsaturated). They contain differing types and amounts of vitamins, minerals, and phytonutrients so it’s best to rotate your nuts to ensure you are getting all they have to offer. We are also emerging from a huge ‘fat scare’ where everyone seemed to be avoiding fats like the plague. Thankfully, we seem to be getting over that as we are realizing that low fat diets actually make things worse. Fats are necessary for health and normal functioning. We need fats; the right kind of fats. Even if you are trying to lose weight and cut calories, you should not be avoiding healthy fats. Now, I’m not saying that you should go forth and consume an entire bowl full of nuts for breakfast, lunch, and dinner everyday. I just want to get the point across that you don’t need to be afraid of nuts and, in fact, should give them a welcomed and important position in your diet amongst all the other healthy foods, like fruits and vegetables. Better yet, use them to bump out some unhealthy foods. Because nuts are high in fats and proteins, they give you more energy and keep you feeling satisfied longer as compared to a sugary snack. Buy your nuts raw, and not roasted. Exposing nuts to high heat strips them of some of their health benefits. The unsaturated fats become rancid and some of the vitamins and minerals can be depleted. Buying shelled nuts is even better, but not as convenient. Store your nuts in the fridge. Unsaturated fats are sensitive to heat and light. Keeping them in a cool, dark place keeps them fresh for longer. When buying nut butters, be sure to check the ingredients. Typical store bought nut butters are loaded with sugars and trans fats. Check the label to make sure the only ingredient is nuts. Nuts can sometimes be a bit hard to digest. Try soaking them for 4-6 hours or overnight. They become softer and, some think, easier to digest. Plain straight up nuts. Not tempting enough? Try adding some dried fruit (… and perhaps a few dark chocolate or unsweetened carob chips) to make a trail mix. Nut butters (natural nut butters with no added ingredients) spread on crackers, bread, celery (ants on a log anyone? ), apples, etc. Sprinkle nuts on a salad. 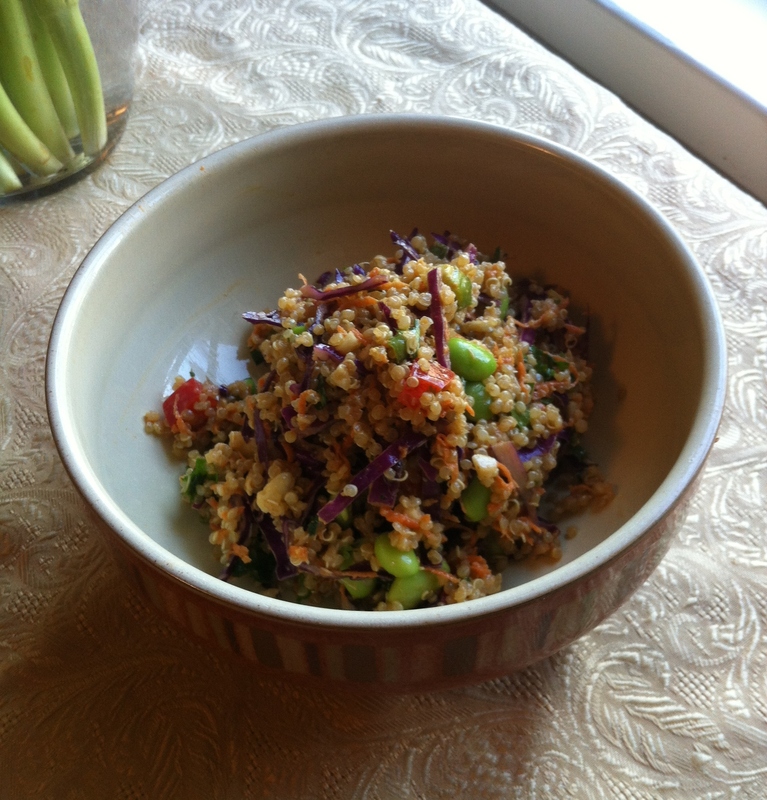 Try a nut inspired recipe like this Asian Cashew Quinoa Salad. Add ground or whole nuts to your oatmeal or hot cereal. Chia and hemp seeds are great for this too. Add nuts or nut butters to a smoothie. 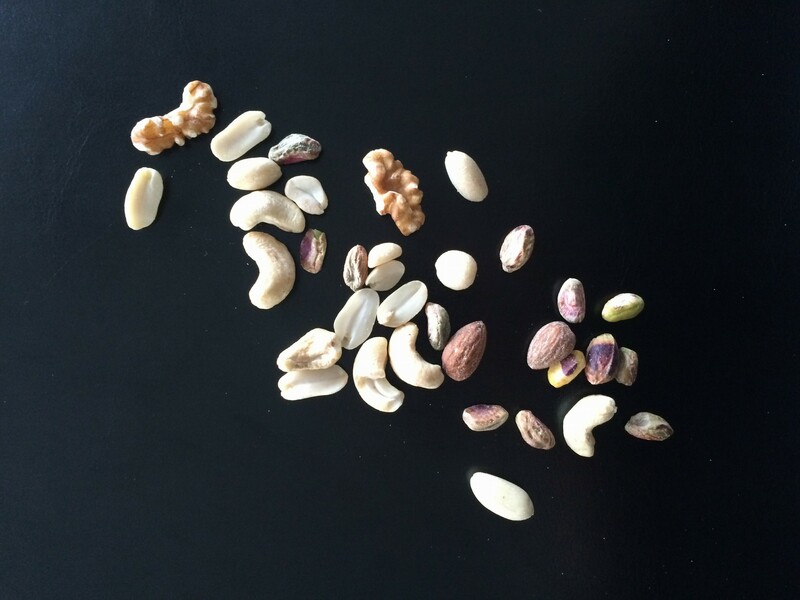 Use different kinds of nuts to make pestos to use on pasta, meat, or as a spread or dip. Grind nuts and use the powder to coat slippery fruits like banana and melon. On top of adding a nutritional punch it also makes them easier for little ones to pick up. Just pop nuts in a food processor, magic bullet, blender, or coffee grinder and pulse until nuts are ground into a powder. Mix ground nuts in baby food purees or cereals. Add ground or whole nuts to yogurt. Wow, it’s been awhile. We have completed our move from Guelph down to the Niagara region and are finally getting settled in. I have been spending a lot of my free time getting acquainted with some of the farmers markets and farms that are in the area. There is certainly no shortage of farm-fresh fruits and veggies down here this time of year; I’m loving it! One of my favourite purchases has been fresh local tomatoes. I try to get all my tomato cravings out at this time of year and then abstain when they are out of season and not-so-delicious. I’ve been trying different varieties this year to see what I may like to try and grow next year. 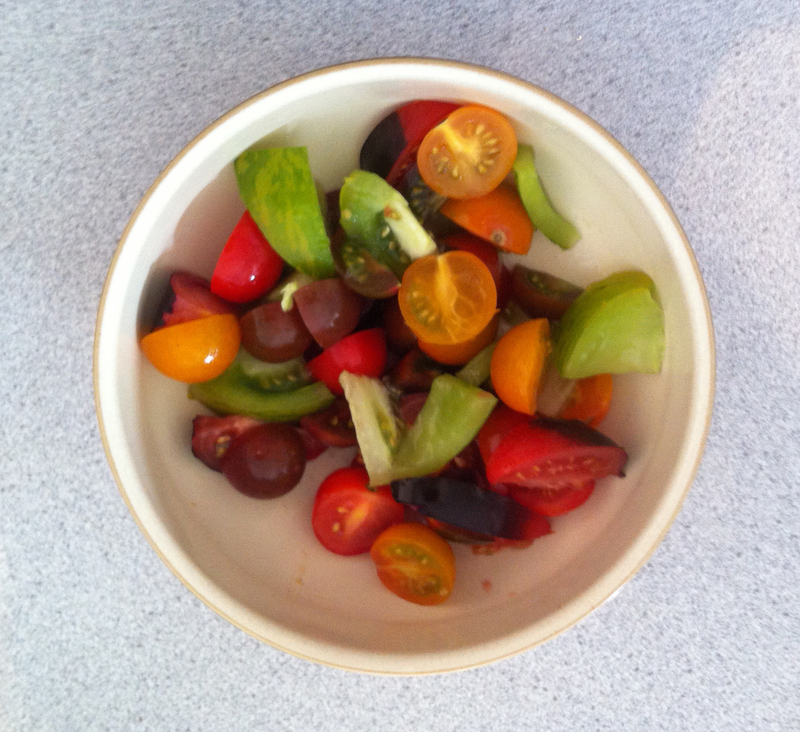 As I was admiring all of the beautiful colours in my bowl, I decided I should share my favourite tomato salad recipe. Unfortunately, I’m the only one in my household who likes tomatoes. Nicholas will eat them sometimes, so I always put a little on his plate just in case, but I make this salad in small portions, as I’m usually enjoying it on my own. That’s ok though, some things are too good to share anyway. This salad is all about winging it with whatever you have on hand, which is part of the reason I like it so much. Since I never measure the ingredients, everything is approximate, and if you don’t have or don’t like one, two, or even three of the ingredients, you can easily leave it out and still come out with a great tasting salad. 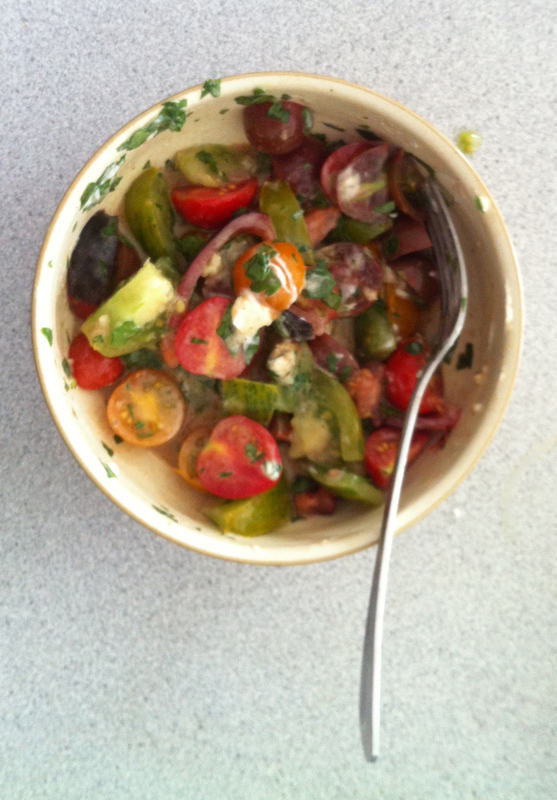 Gently mix everything in a bowl until your tomatoes are coated in a nice creamy dressing (unless you leave out the cheese, then it won’t be creamy). You should have quite a bit of delicious liquid in the bottom of the bowl due to adding salt to the tomatoes. This is intentional, as you can either add some homemade croutons (hunks of stale or lightly toasted bread) to soak it up or leave it to the end to mop up with freshly baked bread. Yum! The summer of popsicles continues! Here is another delish popsicle recipe. This one is loaded with fruit and chia seeds, which not only add some omega-3’s and extra fibre, but also makes the mixture more gelatinous and prevents all the kiwi and strawberry seeds from settling. 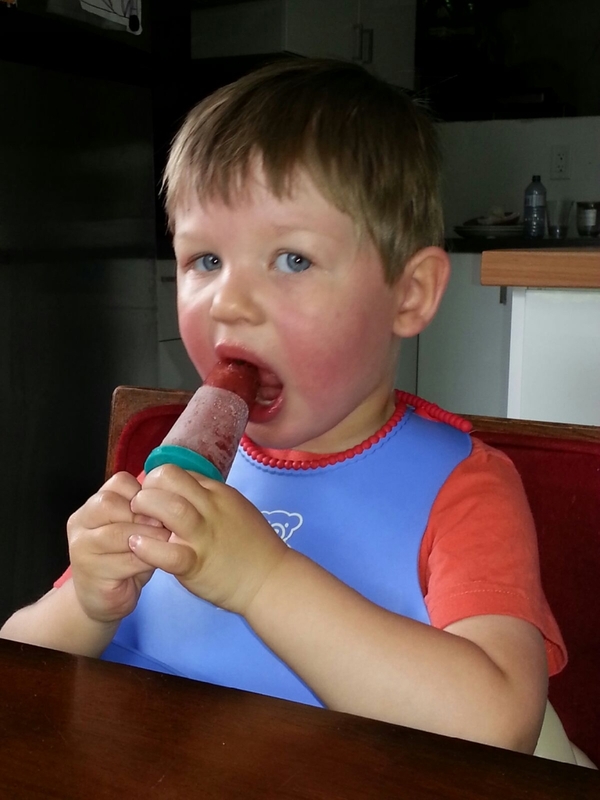 Nicholas’s buddy Jameson enjoying a nice cold Strawberry Kiwi Popsicle. Proof that there are other kids out there who enjoy my creations. I can’t remember where I first saw this recipe, but it is all over the healthy/vegan recipe blogs. 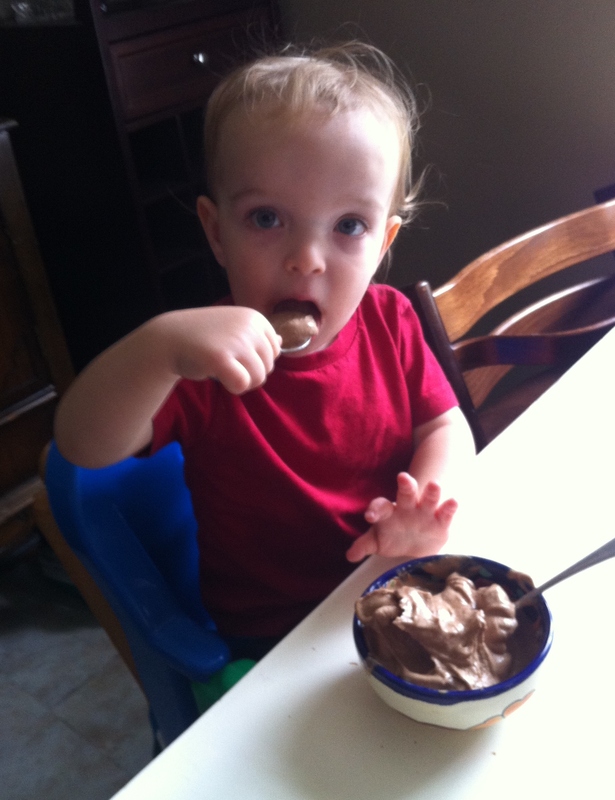 Our family is (mostly) dairy-free, and a summer without ice cream is just wrong. Sure, there is a lot of pre-made dairy-free ice cream on the market, but it’s expensive, and now it’s soooo easy to make your own healthy version. All it takes is one ingredient: frozen bananas. That’s it! Well… plus any flavourings you want. The consistency is that of soft serve ice cream. Yes, there is always that underlying banana flavour, but it works well with many ice cream flavours, hence the banana split, and I don’t think it’s very overpowering. When I first saw this recipe, I thought it was too good to be true. How could I have gone this long without knowing about this? I had to try it for myself. I got out my trusty food processor and some frozen bananas, and minutes later, I had what looked to be soft serve ice cream. I added some cocoa powder and a spoon of peanut butter, blended some more, and scooped it out into bowls for Nicholas and myself. One taste and I was a believer. It’s awesome, and I can tell Nicolas agrees, because he finished his bowl too. I made it again the following night for Isaac to see if it would pass the husband test. He complained that I didn’t give him a large enough serving; I would say that’s a pass! A big thank you to whoever first figured out that frozen bananas turn into ice cream! Scoop into 2 bowls and enjoy! Try experimenting with flavours to create your own. Anything goes; Strawberries, hazelnuts, vanilla, etc. Please share any interesting flavour combinations you’ve tried in the comments section. I have made this particular recipe about 6 or 7 times over the past month alone. I’ve eaten it as a side dish and as a main course. I’ve taken it to BBQs and even used it as payment for babysitting (at the sitter’s request). It’s a hit every time, and I usually get asked for the recipe. So I finally came to the conclusion that I needed to share this incredible find on my blog. Plus, what healthy eating blog would be complete without a quinoa salad recipe? This is sure to be the most delicious cliché you have ever put in your mouth. I found this little treasure while pursuing a remedy to a craving for an Asian inspired quinoa salad. This is the way I find 80% of my recipes; I have something in my head that I want to make (or ingredients in my fridge that I want to use), and I look for a recipe that fits the description. I found this one on vegangela.com and it definitely hit the spot. I love the fresh taste of cilantro, and most recipes don’t have enough for me, but I, surprisingly, didn’t have to change the measurement this time. In fact, I didn’t really change this recipe much at all. It’s creamy, nutty, fresh, and crunchy all at the same time. Perfect! Nicholas doesn’t really like the chunks of cabbage but loves the flavour, so I always take out a scoop for him before I add it. While I have made both the cashew and peanut versions, I prefer the cashew version, as it’s a bit of a lighter flavour, but the peanut version is still divine. From a nutritional perspective, this salad has it all; a rainbow of phytonutrients, healthy fats, and enough plant-based protein to make this a main course option. For an even bigger protein punch, add some shelled edamame, tofu, or shredded chicken. Bring 2 cups water to a boil. Add quinoa, stir, bring back to a boil, and then reduce to the lowest heat setting. Simmer until the water is completely absorbed and the quinoa is fluffy – about 20 mins. *Alternatively, you can cook your quinoa in your rice cooker as you would rice. You need to keep an eye on it though, as it tends to cook a bit faster than rice. In a large bowl, whisk the dressing ingredients together. Add the quinoa to the dressing and mix well to combine. Add the veggies, onions, cilantro, nuts, and edamame/chicken/tofu if using. I officially dub this the summer of popsicles! So many popsicle recipes have been floating around that I decided I needed to go out, buy myself a popsicle mould, and get popsicling. Seems easy enough; throw a bunch of stuff into a food processor, blend it, and then freeze it in the moulds. Kind of like making baby food, except you don’t feel weird about eating it yourself. One of the recipes that really caught my eye used coconut milk and avocado. I googled similar recipes but didn’t find one that totally fit the bill, so I decided to go rogue. I prefer tart flavours and not overly sweet ones. I would never make a popsicle with added sweeteners as I don’t believe its necessary. 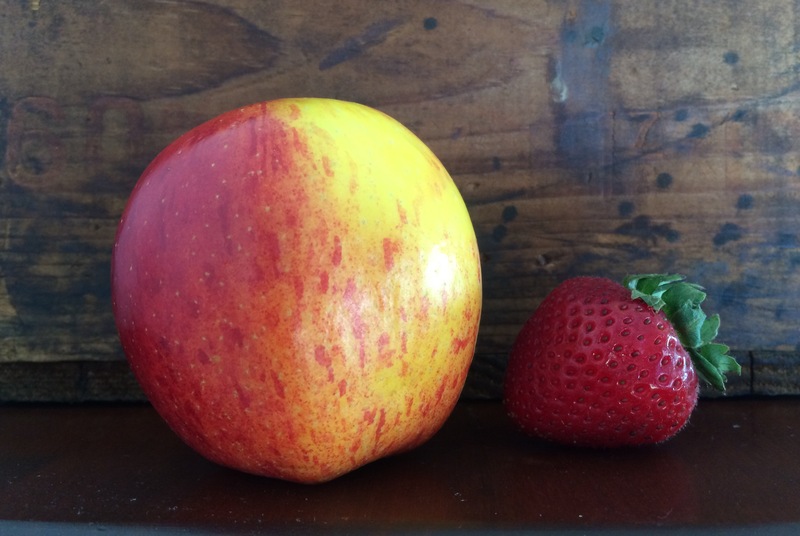 Fruit has enough of its own natural sugars to do the job. 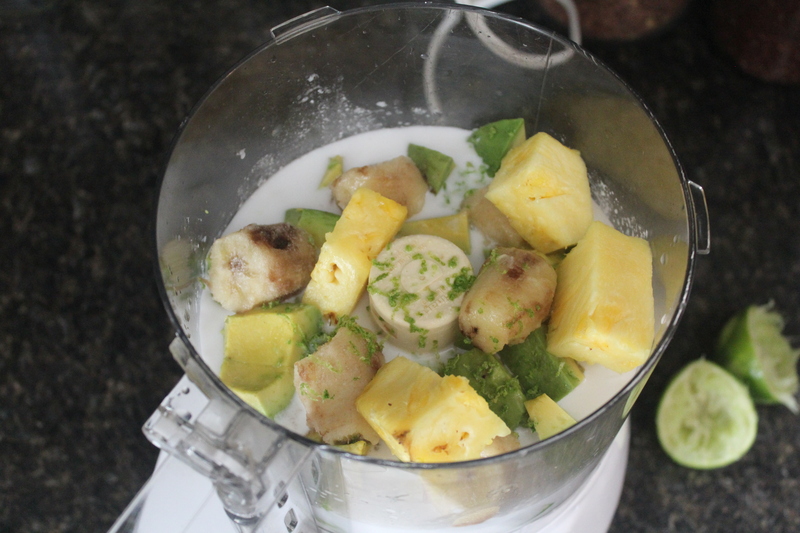 In this recipe I used a ripe banana to add in some extra sweetness. 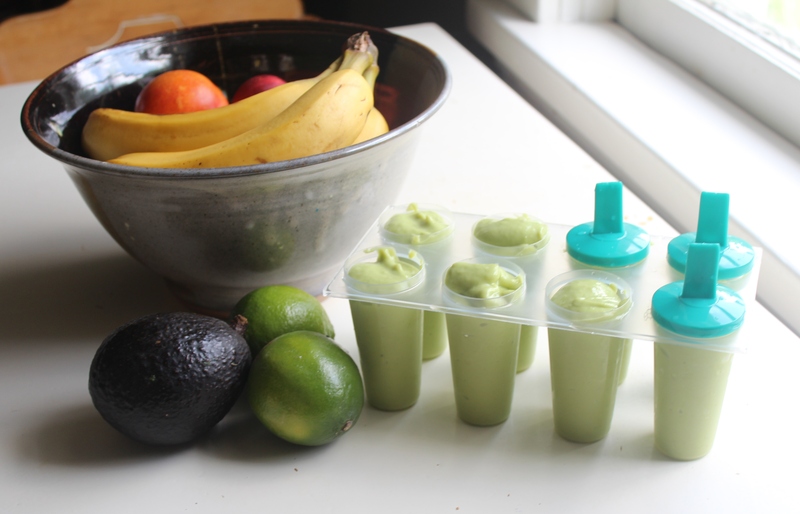 If you have more of a sweet tooth than I do, you can always try adding more banana and less avocado. Also, ensure your pineapple is nice and ripe (more ripe = more sweet). This recipe made eight 2oz pops with some leftover. I probably could have filled at least 1, if not 2, more moulds. These turn out to be nice and creamy. You could probably even partially freeze this (or use an ice cream maker) and serve it as an ice cream.